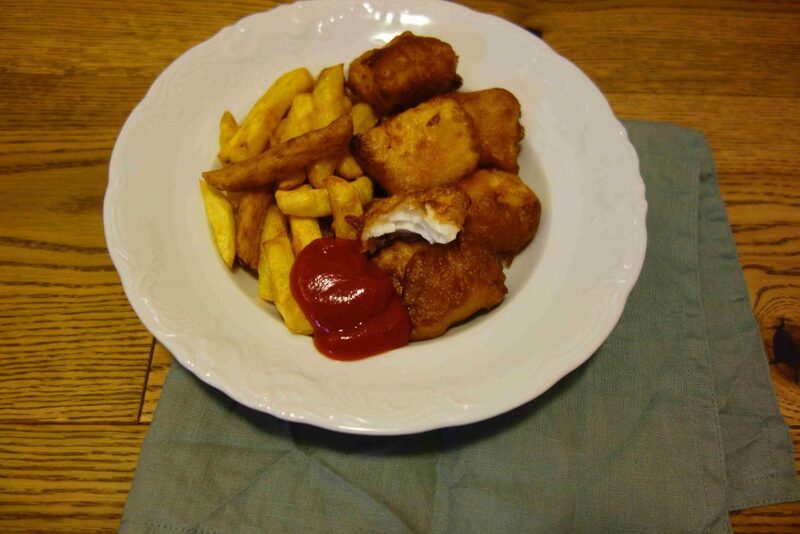 Fish&Chips – So Easy To Make At Home And Way Better Than Takeout! I just love fish&chips. It is not one of the healthiest foods, but it’s perfect soulfood. And sometimes you can definitely cheat on your healthy diet 😉 The beer batter, that I used for the fish, is also perfect for apples. I will definitely try that soon as the first apples from my garden are already ripe 🙂 By the way, there will be a garden update on the blog soon. If you follow me on instagram and facebook, you might have seen a lot of my harvest yet 😉 Okay guys, let’s go on to the recipe! First, you have to make the beer batter. Therefor put the flour, baking powder, salt and beer in a bowl. Whisk it all together and let the dough rest for 15 minutes. In the meantime you can cut the cod in bite-sized pieces. Now heat up the oil for deep-frying in a high pot. It is hot enough when you see bubbles coming up, when you put a wooden skewer in. Then you cover the fish pieces in beer batter and put them into the hot oil. Fry them until golden brown and crispy and let the excess fat drip off before eating.